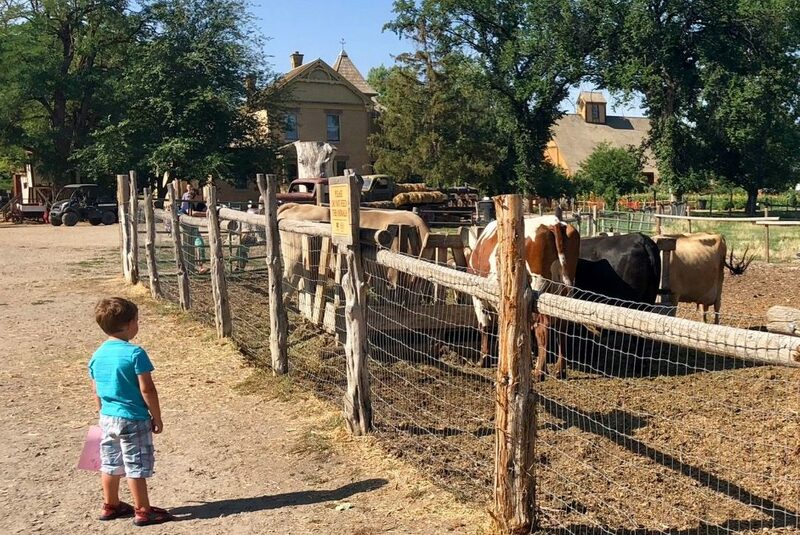 Wheeler Historic Farm with Kids: Free Fun! 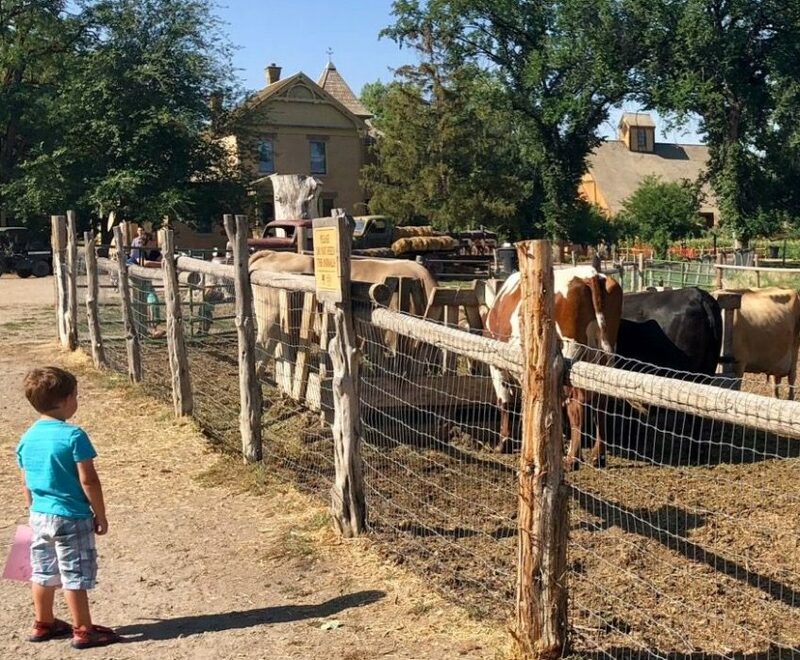 Salt Lake City’s Wheeler Historic Farm has free admission, is open year round, and is a fantastic place to visit with little kids. At the farm, you can take a wagon ride, watch cows being milked, admire the collection of old tractors (which my toddler boys LOVED to do), tour the old farmhouse, and sometimes even see a blacksmith at work. In addition to all this, a corner of the land is still preserved woods that run along a creek, and there’s an impressive playground and lots of a picnic tables, too. It’s one our favorite places to take kids in Salt Lake City. 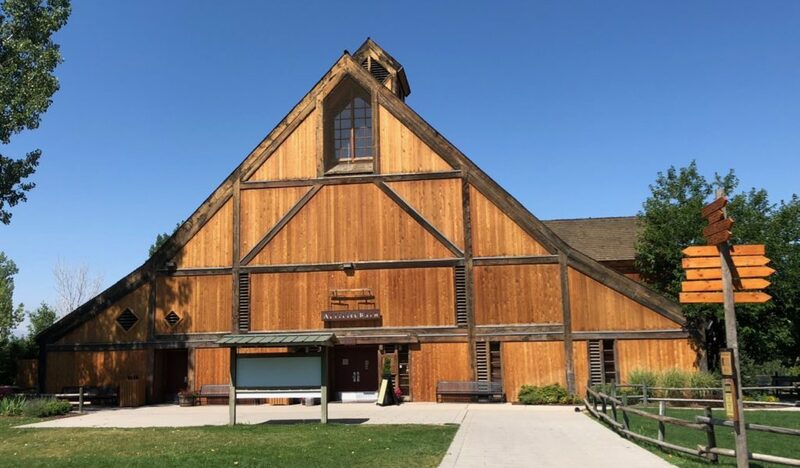 The giant barn is hard to miss! Start here: pick up a map and an animal bingo sheet. It’s a great way to convince your older kids that they really do want to look for ducks. Wheeler Historic Farm has a pretty interesting history, too. It was purchased and developed as a farm in the mid-nineteenth century, and remained that way for over a century. In 1969, the land was purchased by Salt Lake County with the intent of removing the historic structures and developing it into a regional park with sports fields. Fortunately for the rest of us, in 1974 the Junior League approached the county with the idea of keeping it running as a historic farm, and Wheeler Historic Farm was born. Wheeler Farm is full of these picturesque old farm vehicles. I wish for you kids that will pose for cute portraits in front of them…clearly, mine wouldn’t. When you first get to Wheeler Farm, steer the kids away from the playground that is adjacent to the parking lot, and toward the giant barn. 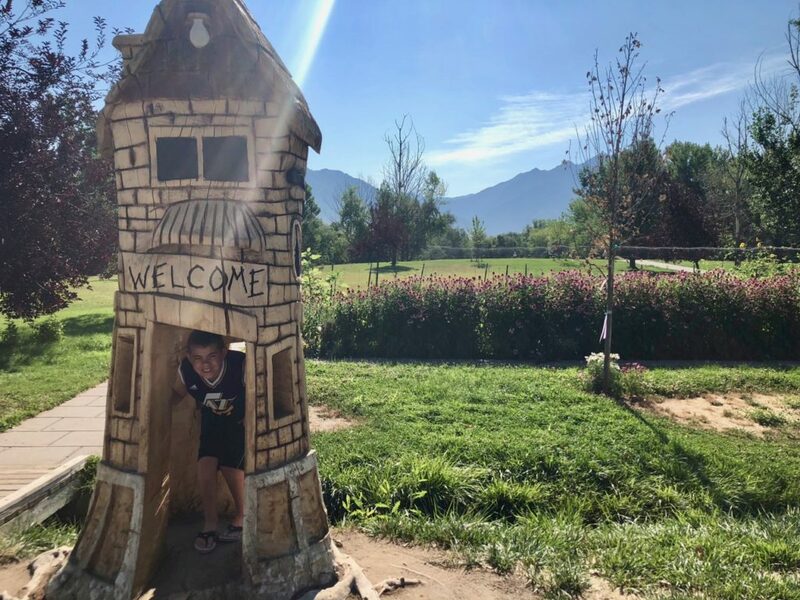 Promise them you will come back later…they may throw a fit, but assure them that playgrounds are a dime a dozen and there are real live animals to see. In the barn, there is an information office where you can get a map as well as buy tickets for the few activities that aren’t free. Wagon rides, farmhouse tours, and cow milking cost $1 to $4 per person depending on the activity. From the barn, follow the path through the fields toward the animals. Look for cows, horses, turkeys, ducks, pigs….you get the idea. The property is huge, and if you want to see most of it, including the woods, I would recommend the wagon ride. For a short visit, you can just wander through the animal pens. If you need a break (and if it’s summer, you will!) stop by the Rosebud Country Store for drinks and snacks. Just outside of the store is a blacksmith shop. There aren’t regular demonstrations, but they do demonstrations for school groups. If you are lucky, you will get there at the same time as a preschool field trip and you can spy on a real blacksmith molding metal. On your way out, cross the parking lot to the playground and let the kids finish expending all their energy. There are plenty of picnic tables here, too, and this is the best place to eat if you have packed a lunch. Don’t miss the awesome chainsaw carvings that line the sidewalk as you go in. The Wasatch mountains are showing off in the background here. At the information office in the barn, ask for the free animal bingo sheets. I’m not ashamed to admit I promised my kids an ice cream at Rosebud Country Store if they got a bingo blackout, and the interest in seeing all the animals instantly ratcheted up for my oldest son. Dress for the weather! This is an outside venue. Consider bringing hand sanitizer. This is farm. Animals poop on the ground. Kids touch things. Wheeler Farm has the cutest backgrounds EVER for photos. 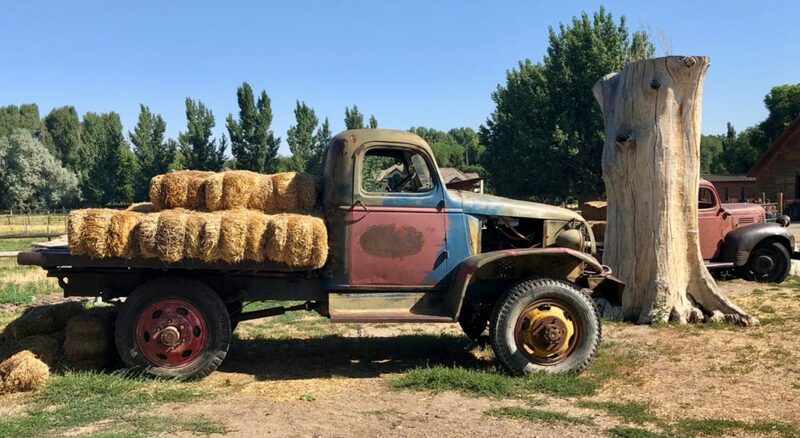 There are lots of adorable old trucks and farm equipment in addition to hay bales and flowers galore. I did not dress my kids for cute portraits, but I wished i had! Wheeler Historic Farm is located at 6351 South 900 East in Murray, Utah, just north of I-215. Take the Union Park Avenue exit, Exit 9, off of I-215 to get there. It is well marked with signs.